Many different versions of cleansing diets exist. They range from near starvation juice fasts to plans that emphasize whole foods while shunning processed foods. Some cleanses recommend you ingest herbal supplements and specific colon cleansers, which aren't regulated by the Food and Drug Administration and might contain diuretics or other potentially harmful ingredients. Most cleanses severely restrict calorie intake, making it difficult to meet your energy needs. Ask your doctor before undertaking a cleanse which can cause dehydration and other risky side effects. Block out seven days for your cleanse. Choose a week in which you have minimal social commitments, work stress, family obligations and travel planned, since these can make it hard to stick to a reduced calorie diet. Decrease your caffeine intake. Slow down on coffee, tea or soda consumption for two or three days prior to the official day one of your program to minimize withdrawal symptoms. Eat more fruits and vegetables in these days as well to begin to adjust your body to the increased fiber involved in your cleansing diet. Consume no caffeine, tobacco or alcohol for the duration of your cleanse. Clear your cupboards of processed foods like breakfast cereal, canned soup, snack foods, soda and dinner kits. Avoid all foods that come in cartons, plastic, boxes or cans. Eat fresh fruits and vegetables as the bulk of your diet. Breakfast should consist of raw fruits and nuts. Choose dark green and orange types like kale, spinach, bell pepper, artichokes, asparagus, carrots and squash for snacks and for lunch and dinner. Eat them steamed with just a squeeze of citrus or fresh herbs. Go organic when possible to limit your exposure to pesticides. 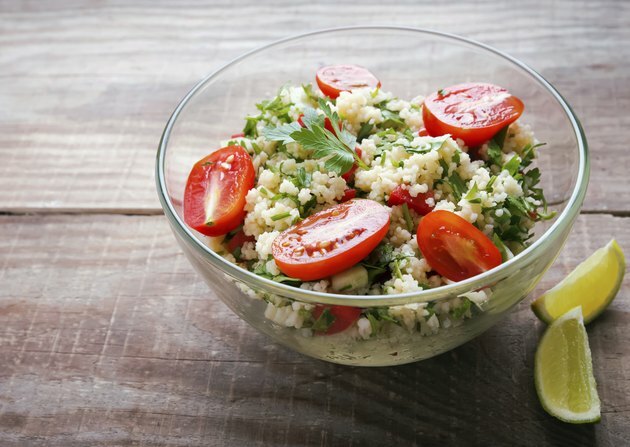 Include ½ cup servings of whole grains like brown rice or quinoa at most meals to provide energy. Cook these in water and flavor them with mushrooms, sea vegetables, spice and dried fruit--with no added sugars. Avoid meats and dairy during a cleanse, advises Glassman. Eat fish or beans as your primary source of protein. Snack on nuts, dates or cut up vegetables and fruits. Exercise modestly during the cleanse. Take a brisk walk daily to stay active but not overly tax your system. Drink plenty of water, unsweetened herbal tea or freshly squeezed fruit juices to help smooth digestion and to avoid dehydration. Ease off your cleanse after your week is up. Add in your favorite foods gradually--perhaps one a week--so as not to shock your system with a heavy, processed meal immediately and undo all the good you did during the week. Be sure to take in at least 1,200 calories per day for women or 1,500 for men, says Medline Plus. These are the bare minimums needed to support nutritional needs and energy for daily function. If you're following a cleanse for weight loss, know that much of the weight you lose will likely return if you go back to your normal eating habits after a week. To promote long-term weight loss, stick to the healthy habits you undertake during the cleanse, but allow yourself some low-fat dairy and additional protein. A drastic cleanse can lead to symptoms such as diarrhea, nausea, dehydration and dizziness, warns registered dietitian Keri Glassman. Even if you ease off caffeine before the cleanse, you may experience withdrawal symptoms like headaches during the week. Increased fiber intake can cause cramping and other digestive discomfort for the first few days of the cleansing week. CBS News: Do Detox Diets Work?